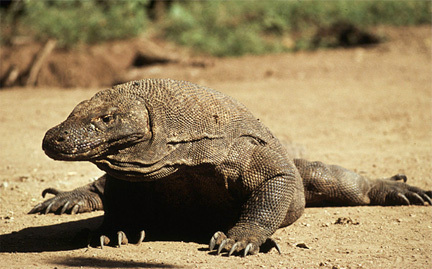 The endangered Komodo dragon is the largest living lizard. Komodo dragons are at the top of their food chain and one of the largest animals in their range. Vision and hearing play roles in hunting, but the Komodo dragon’s sense of smell is its main food detector, sometimes sensing carrion more than two miles away. Komodo dragons are able to expand their flexible skull and throat to be able to swallow very large pieces of food.